So I was asked to make a decorated cake for my cousin’s rehearsal dinner. That’s right. Me. 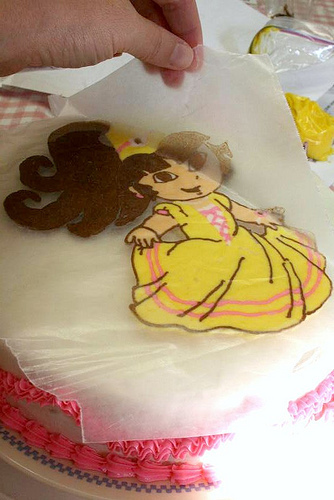 A Decorated Cake. For a rehearsal dinner. I am not a complete cake novice (I actually took a cake decorating class back in the day with my friends Ashleigh – now the amazing Mississippi Photographer of Ashleigh Coleman Photography) but all the Wilton equipment could not really prepare me for what I was about to go though. So, I wanted to avoid the “homemade cake” look, and also avoid experimenting with fondant. (I have never used fondant, and didn’t want to try for a rehearsal dinner.) So I found the most awesome exciting cake decorating technique for easy cake decorating through Pinterest. Once we were done (my husband was so helpful! ), I hated it. It was pretty “homemade” looking” and NOT what I expected. But, I had to take it. And, I had to show it to the bride and groom. AH! I cried and hated every minute of that 20-minute drive. I swore to never again make a cake for a rehearsal dinner! I was able to slip it into the venue without seeing people – but then the moment of truth came. AND THEY LOVED IT! What? I was still crying. But I pulled myself together for a photo. Everyone said it was amazing. I am only sharing this because this tutorial is possible. But it is HARD! Not for the faint of heart. You maybe you can learn from my mistakes. There you have it! I hope you can lend some incite into YOUR cake-decorating experiments. Anything to make me feel better? BTW, you don’t need to pin this. Or share it. I am not super proud of this moment :). FULL CAKE DECORATING TUTORIAL HERE.